WASCAL'S WECORDS SELLS BIFF WOES BECAUSE IT'S THE WIGHT THING TO DO. Price includes shipping. CDR's are created with the approval of Biff Rose. 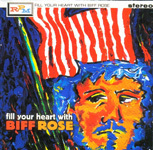 Order any Biff Rose CD and receive a free copy of "Chapel On The Hill", a compilation of later material assembled by Biff Rose. Stare into the eyes of Jesus for the milk of human kindness. Four color silk screen printed on a quality white tee shirt. Hand drawn by Biff Rose. Iron-on Transfer on a quality white tee shirt. Hand painted by Biff Rose. Order 2 or "we've only just bb gun". 2 for $20. Order 2 or "the rifle tower". 2 for $20. Donate to receive a free digital download or vinyl copy. Donate here. 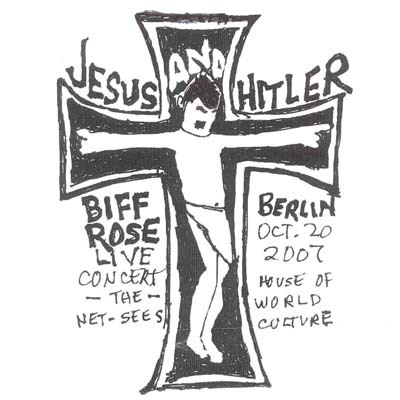 Biff was invited (and paid) to perform a rare public performance at the House of World Culture in Berlin, Germany on Oct. 10, 2007. Recorded for German radio, this recording captures it all including an emotional "Just Like A Man". Career spanning compilation released on RPM in England.